Top (L-R) Audra Ibarra, Judge Jeffrey Barton; Bottom (L-R) Judge C. Todd Bottke, Judge Kenneth So. 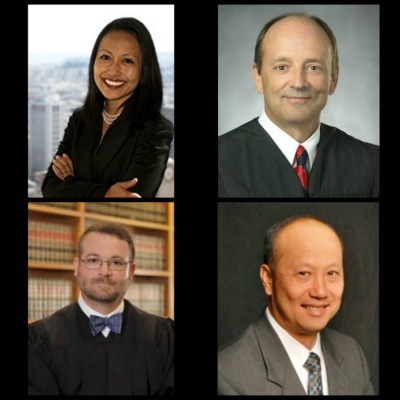 SAN FRANCISCO—Chief Justice Tani G. Cantil-Sakauye has appointed two new advisory members and reappointed another advisory member to the Judicial Council of California, the policymaking body of the judicial branch. The appointments take effect September 15. Two of the appointments are annual appointments designated for the president of the California Judges Association (CJA) and the elected chair of the Judicial Council’s Trial Court Presiding Judges Advisory Committee. Tehama Presiding Judge C. Todd Bottke is the CJA president-elect and San Diego Presiding Judge Jeffrey Barton is the new chair of the presiding judges’ committee. The Chief Justice also reappointed San Diego Judge Ken So for another three-year term. Judge So currently serves as chair of the Judicial Council’s Policy Coordination and Liaison Committee. Advisory members of the council are non-voting members and do not cast votes to approve or adopt proposals before the council. Also joining the council on September 15 is attorney member Ms. Audra Ibarra, who will be a voting member with a three-year term. Four of the Judicial Council seats are assigned by California’s Constitution to attorneys who are appointed by the State Bar Board of Trustees. According to the state Constitution, the Chief Justice chairs the Judicial Council and appoints one other Supreme Court justice, three justices from the courts of appeal, 10 trial court judges, two nonvoting court administrators, “and any other nonvoting members as determined by the voting membership of the council.” Judicial Council members normally serve three years, and new terms begin in September. The State Bar’s governing body appoints four members, and the state Senate and Assembly each appoint one member.